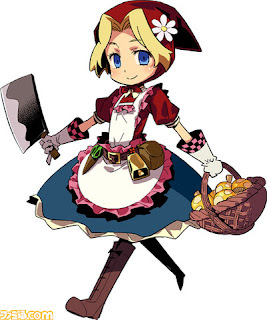 I mean, who wouldn't want to play as a butcher-knife-wielding milkmaid? Don't you just love how the pinky finger of the hand holding said butcher knife is flared like it would be if the little lass was enjoying a cup of Earl Grey tea? Anyway, Etrian Odyssey III: Visitor from Star Ocean will hit store shelves in Japan on April 1. Hopefully it'll be released in other regions shortly thereafter. Heck yes! Any girl character who looks cute AND tough-as-nails is great in my book.